Magnified Eye are a groove rock band placed in the Stoner rock category who hail from Århus in Denmark. This is the bands second full length release and shows a maturity of the sound. The band strings the eleven tracks together with short instrumental-acoustic pieces to tell one story. The CD begins with a soundtrack from a horror movie before the first track, Fiend, blasts out of your speakers. The band immediately attaches to you with a great dark groove. I really like the way the harmony guitar comes out of the sound at you. There are many more interesting sounds mixed in and better lead guitar work on this CD compared to the debut. A short acoustic piece called Dawn Of The Muse leads into Among Heathens. Among Heathens is a heavy rock anthem and includes some cool harmonica, but mostly mixed far to the background. The title track, Transitions, is next. It begins with a cool bass line and some strange noises. It is a number highly influenced by QOTSA but the band mix a lot of cool sounds and weird stuff into the mix and I really like the bass sound and wah guitar. Soulflame, a song the band have been playing live for some time is next and is a real headbanger. The acoustic piece before the best song on the CD, Jezebel, is excellent. Jezebel brings things down to start and Torben sings like the guy from TOOL. Actually this song is quite TOOL inspired but done very well. "I want to dig your heart out with a spoon". Religious Children Come In Herds follows and did not really grab me. Pretty standard ME song. In Circles has a very interesting vocal beginning and guitar riff before the band rock on and again features the harmonica, mixed well to the background. A cool song. W.U.T.T. is a short bluesy number with just vocals and harmonica. Interesting! Out Of The Shadows features the harmonica of Magnus prominently to give this song a different flavour. Pledge Of Secrecy is a nice 1½ minute electric guitar instrumental before we get carried away with Drain The Lizard, a very different melodic song. Marooned begins very slowly and Torben really delivers his most passionate vocals on the record and Magnus contributes some cool harmonica as well. A slower more pounding song. The CD ends with the excellent short bluesy Songs Of Sweet Dreams. The way the drums are mixed with the strummed guitar is really cool. Magnified Eye is an excellent band and I enjoyed this CD very much. 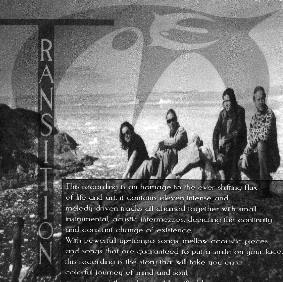 It certainly is a transition and progression of the band. Check this one out. If you liked the first CD you will love this one as well.